Two people have been killed and 12 wounded when a car careered into a crowd of people watching the Dutch royal family riding past in an open-top bus, police said. The incident took place Thursday in the town of Apeldoorn during celebrations for Queen’s Day, an annual holiday in the Netherlands. 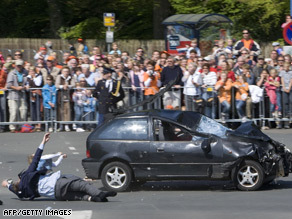 Queen Beatrix was in the bus with her family when the black hatchback zoomed past. The crowds were behind barriers off the road, but security officials and journalists, including many cameramen, were in the road as the car went by. The car crashed into the low metal railing around a column on the side of the road. The car appeared heavily damaged even before the crash, but the reason for that was unclear. The reason for the crash has not been revealed and there was no word on the condition or identity of the driver.